Knowledge is power in treating patients with DME. 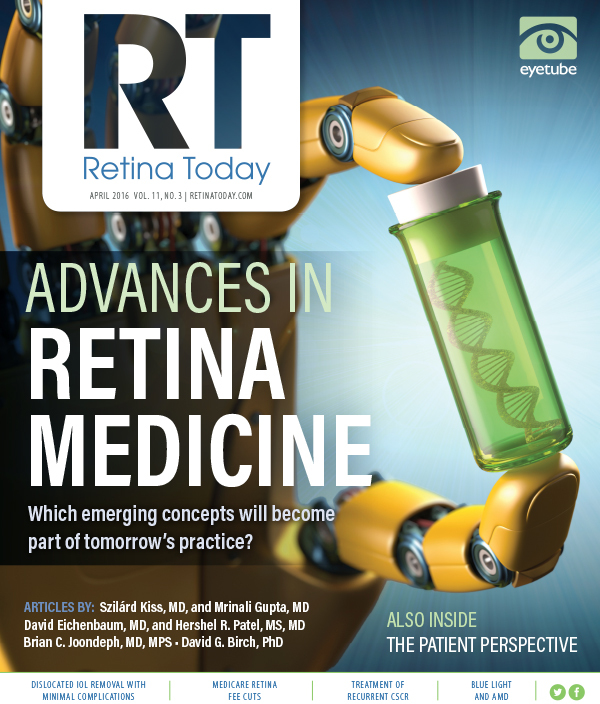 At one time, laser photocoagulation was the only option for treating patients with diabetic macular edema (DME), but retina specialists now have three anti-VEGF agents in their arsenal: ranibizumab (Lucentis, Genentech), aflibercept (Eylea, Regeneron), and bevacizumab (Avastin, Genentech). These drugs are so effective at neutralizing biologic VEGF that they are simultaneously diagnostic and therapeutic; if they are effective in the treatment of DME in a given patient, then we know that the patient’s DME is VEGF-mediated. • Anti-VEGF drugs must be dosed frequently and regularly in order to produce the intended biologic effect. • Anti-VEGF agents are both diagnostic and therapeutic; if they are effective in a given patient, this means the patient’s DME is VEGF-mediated. • According to the EARLY Analysis, visual acuity stratification observed after three anti-VEGF injections in DRCR.net Protocol I predicted visual acuity outcomes at one year despite continued anti-VEGF treatment. Large prospective clinical trials have consistently confirmed that many patients have VEGF-mediated DME.1,2 In the RIDE and RISE trials, 39% of patients met the primary endpoint of 15 or more letters of visual acuity improvement at 2 years (Figure 1).1 Similarly, in the VISTA and VIVID trials, 38% of patients met a secondary endpoint of 15 or more letters of visual acuity improvement at 100 weeks.2 This article reviews recent findings related to the treatment of DME with intravitreal injections of anti-VEGF agents. Figure 1. Patients gaining 15 or more ETDRS letters from baseline at year 2. Three-line gains in visual acuity were seen at 24 months in almost 40% of patients treated with ranibizumab. Furthermore, treatment with fewer anti-VEGF injections for DME has been correlated with less visual acuity improvement compared with the results seen in these randomized clinical trials.6 Anti-VEGF agents are not magic; they are pharmacologic agents with a vitreous half-life. They must be dosed frequently and regularly in order to produce the intended biologic effect. Nevertheless, we can find assurance in data from numerous prospective clinical trials that anti-VEGF agents, given frequently and regularly, are effective for treatment of DME. Furthermore, the safety profiles of these agents have been rigorously studied, and they have been deemed safe for patients with diabetes mellitus.1-3 Thus, all three anti-VEGF agents are generally considered first-line therapies for treating center-involved DME. The majority of the analyses of these clinical trials (RIDE and RISE, VISTA and VIVID, and Protocol T) have focused on the patients who improved with anti-VEGF treatment. But what about the patients who did not improve? Roughly 60% of patients in RIDE and RISE did not meet the primary endpoint of the study after receiving monthly ranibizumab for 2 years, and more than 60% of patients in VISTA and VIVID did not meet a key secondary endpoint even though they received monthly aflibercept through week 100.1,2 Despite the positive results of Protocol T for patients with poor vision at baseline, between 33% and 50% did not improve by 15 or more letters at 1 year, even after receiving nine to 10 anti-VEGF injections.3 Thus, VEGF is clearly not the whole story in DME, and there is an opportunity to do more for patients who have the condition. The Early Anti-VEGF Response and Long-term Efficacy (EARLY) Analysis of the DRCR.net Protocol I study is unique and thought-provoking because it examines the patients with DME who did not respond well to anti-VEGF therapy. The EARLY Analysis was an independent, post hoc analysis of the ranibizumab arms of Protocol I. Its purpose was to examine anti-VEGF treatment response at week 12 and to determine if it correlated with long-term BCVA outcomes in DME.7 The results are surprising. The EARLY Analysis divided patients into three groups based on their response at week 12 after three monthly anti-VEGF injections: those who gained less than 5 letters, those who gained 5 to 9 letters, and those who gained 10 or more letters. The analysis found that 39.7% of patients improved by less than 5 letters. In fact, the mean visual acuity improvement in this group, which represented the largest group of patients from the entire cohort of monthly ranibizumab-treated patients, was -0.3 letters. The other groups were smaller: 23.2% of patients gained 5 to 9 letters, and 37.1% of patients gained 10 or more letters. Only 17.6% of patients gained 15 or more letters by week 12 (Figure 2). Figure 2. On average, stratification observed after three injections persisted for the first year. This surprising result is best described by the term swimming in their lanes. If patients had a poor initial visual acuity response to anti-VEGF therapy (ie, <5-letter visual acuity gain), then they were unlikely to fare much better by 1 year. The mean visual acuity improvement for these patients at 1 year was within 5 letters of both baseline and the week 12 visual acuity results. In fact, visual acuity improvement at 12 weeks was a mean -0.3 letters, and by week 52 it was a mean 2.8 letters. Similar results were observed in the group of patients gaining 5 to 9 letters by week 12, with mean visual acuity improvement of 6.9 letters at week 12 and mean visual acuity improvement of 8.2 letters at week 52. For the group of patients gaining 10 or more letters at week 12, the mean improvement at week 12 was 15.2 letters. By week 52 the mean visual acuity improvement was 16.5 letters. Thus, each group swims in its own lane. On average, the visual acuity stratification observed after the first three anti-VEGF injections persists for the first year despite continued anti-VEGF treatment. 1. Nguyen QD, Brown DM, Marcus DM, et al. 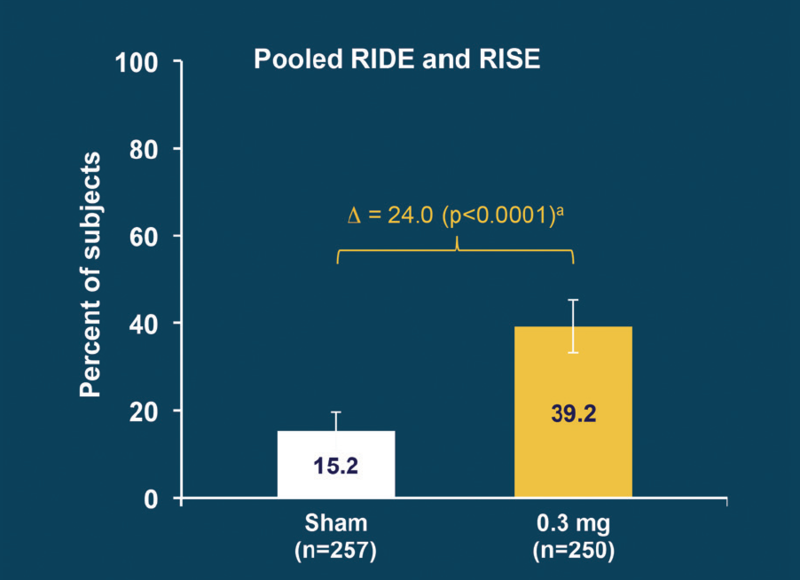 Ranibizumab for diabetic macular edema: results from 2 phase III randomized trials: RISE and RIDE. Ophthalmology. 2012;119(4):789-801. 2. Korobelnik JF, Do DV, Schmidt-Erfurth U, et al. Intravitreal aflibercept for diabetic macular edema. Ophthalmology. 2014;121(11):2247-2254. 3. The Diabetic Retinopathy Clinical Research Network. Aflibercept, bevacizumab, or ranibizumab for diabetic macular edema. N Eng J Med. 2015;372(13):1-11. 4. Wells JA, Glassman AR, Ayala A, et al. Aflibercept, bevacizumab, or ranibizumab for diabetic macular edema: two-year results from the comparative effectiveness randomized clinical trial [published online ahead of print February 27, 2016]. Ophthalmology. 5. Kiss S, Liu Y, Brown J, et al. Clinical utilization of anti-vascular endothelial growth-factor agents and patient monitoring in retinal vein occlusion and diabetic macular edema. Clin Ophthalmol. 2014;8:1611-1621. 6. Holekamp NM, Campbell J, Cole A, et al. Real-world vision outcomes in DME treated with anti-VEGF injections — an analysis of EMR data from a large US health system. Paper presented at: American Society of Retina Specialists Annual Meeting; August 9-13; San Diego, CA. 7. Dugel PU, Campbell J, Holekamp N, et al. Long-term response to anti-VEGF therapy for DME can be predicted after 3 injections: an analysis of Protocol I data. Paper presented at: The American Academy of Ophthalmology Annual Meeting; Nov 13-17, 2015; Las Vegas, NV. 8. Elman MJ, Qin H, Aiello LP, et al. Intravitreal ranibizumab for diabetic macular edema with prompt versus deferred laser treatment: three-year randomized trial results. Ophthalmology. 2012;119(11):2312-2318. • director of retina services at Pepose Vision Institute in St. Louis, Mo. • financial disclosure: consultant, speaker, and recipient of research funds from Allergan, Alimera Sciences, Genentech, and Regeneron; consultant and stock options, Katalyst; recipient of research funds from Ophthotech and Neurotech.